Hi Everyone! I am pleased to present our guest host for today, CC, who blogs here. CC here, happy to be hosting Poetics here at d’Verse again. I love popping in to d’Verse whenever time allows. It’s such a great place to be. I enjoy the friendly community and amazing writing so much. Thank you for always making me feel so welcome. Lately, I’ve been thinking a lot about mistakes…not minor ones either, but the major mistakes we make that alter our lives irrevocably. It’s struck me as rather interesting that these mistakes can come with silver linings that we perhaps don’t see in the panicked moment of “Uh-oh! What have I done?” Hindsight and time can sometimes turn what seemed like the tragic end of the world into something exquisitely beautiful. Sometimes the best part about mistakes is walking away from them when they’re over, but still being able to remember them and the lessons they’ve taught us. Sometimes we fall flat on our faces and it hurts. A lot. But, sometimes, even in the pain, we learn. What have you learned from your mistakes? What is your most beautiful mistake? Since even monkeys fall from trees* I know that we have all made mistakes, so this should be an easy prompt! For this prompt, think of a mistake you’ve made. 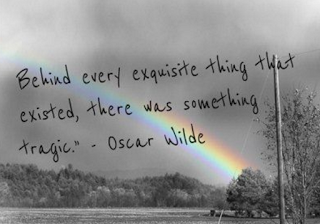 Think of what you learned from it or maybe how you thought it was the end of the world and it surprised you by turning out okay or bringing something exquisite into existence. Or, think of how it stretched you beyond your wildest imagination or how you would now say, with the benefit of hindsight, you’d actually regret not having made that ‘mistake’ in your life. Share something serious or funny….make us cry or laugh or teach us something from your own experience of mistake-making. My pleasure, Grace and thanks for ‘tending bar’ while I was at work 😉 I just got home…..you’ve completely piqued my curiosity and I look forward to reading yours!! Hello everyone. I wrote about an incident that occurred years and years ago in my wild youth. I hope you all enjoy! I really like this prompt… but I couldn’t find those mistakes that really made my life better… just a stupid one I did earlier this year… missing a flight is a rather small price to pay… (yes there was a loss of money involved). I’ve had a couple of life changing mistakes but didn’t feel like writing about them. Sometimes you just need to let things be. 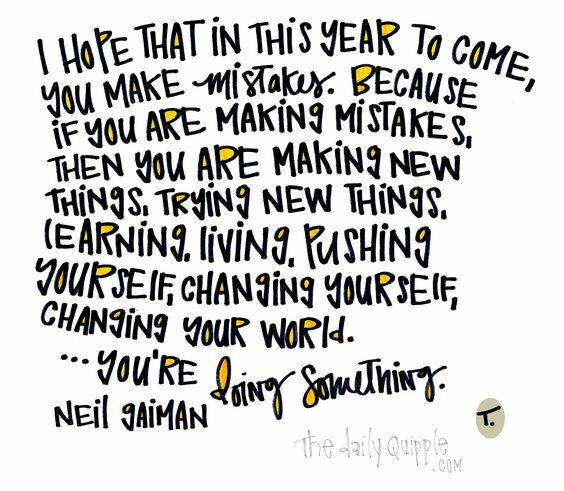 BUT….one mistake I made, that I was reminded of by the quote was accidentally buying a graphic novel by Neil Gaiman years ago while, yes, being the only female in the comic book store. Wonderful writer. Yes you do. You can’t keep on and on reliving it, regretting it, moping. This is one of the hardest challenges, I have faced, as I am still paying the price, for my various major mistakes, in my life. And not sure, if I am writing to write about them, yet. Especially, the one that involves my mom, that shattered everything, in my life, forever. Exactly. which is why I wrote what I did about a humorous mistake. Not ready to peel back some layers. I’m at that place, too. I tried to write about my major blooper, but it was too painful, so I’m starting again to find a funny. Thank you for tending bar tonight, CC. You pushed me to lift the lid on a few things. I’m glad I did. It wasn’t easy though! Freya, so happy to hear you’re glad you lifted the lid….I’m looking forward to reading what you uncovered 🙂 Thanks for joining us! Wonderful prompt, CC…it’s so nice to have you hosting today. I’m off to write right now! Loved this prompt. Thanks, C.C.! Awesome 🙂 You’re welcome, De! Can’t seem to open either of Nan’s links 😦 Is it just me having this problem? Looking forward to reading it….I always enjoy your writing so much, Laura 🙂 Will be by soon! Sounds intriguing….coming by to check it out soon….. I forgot to post a comment this morning but I found this prompt interesting. It made me delve into memories I haven’t thought about in years. Thanks for joining in, Arcadia….I look forward to reading where it took you! I didn’t make it into the link sharing, bbut this was a helpful, healing prompt for me. Thank you, CC!